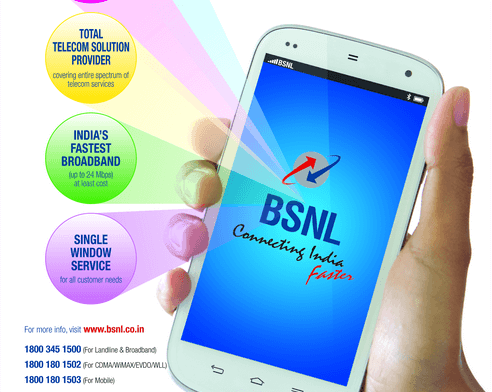 For the very first time in what seems to be a revolutionary step, the PSU telecom operator BSNL has launched dedicated voice add-on packs for its landline subscribers in Hyderabad telecom district of Andhra pradesh circle which includes Telangana. The new add-on packs provide true unlimited calling to any local or STD landline or Mobile number across India for all 24 hours of the day. The voice add-on packs can only be applied by subscribers who have a broadband combo plan with fixed monthly rental of Rs.700 or above. The packs come in two variants the first one has a denomination of Rs.48 and offers free unlimited calls to only local landlines and mobiles within the circle, the second one comes with a denomination of Rs.98 and offers the benefit of free unlimited calls to both local and STD landlines and mobiles across India. The add-on packs come as an extension of the already provided service of unlimited free night time calling for 9 Pm to 7 Am provided by the operator. The plan at the moment has been launched only for Hyderabad telecom district from today for a promotional period of 90 days. The add-on packs are available for personal non commercial use only, which implies that calls should not exceed more than 300 unique numbers in a month. Guys, do you have the exact circular? I applied for it in BSNL office and they said they have not received any circular on this so far.